I just did a search on Mel's Mix and was very surprised that it came up empty. This is my first year trying the SFG plan and today I got my space ready. Next step is to mix up something to plant in! If anyone has advice, suggestions, dos and don'ts, they would be greatly appreciated. Also, if anyone is from around the Hamilton Ontario area and has suggestions for where to get peat moss/vermiculite/compost, I would like to hear from you. I don't know why it did not come up (not for me either)??? But here is a pretty good discussion. @skidmoca: is Hamilton anywhere near Ottawa? If so the Trolley Driver gets around a bit and may be able to help you. @Kelejan wrote: @skidmoca: is Hamilton anywhere near Ottawa? If so the Trolley Driver gets around a bit and may be able to help you. Unfortunately, Hamilton is a five or six hour drive from Ottawa on a good driving day with a biobreak during the trip. Skidmoca, You can find most of what you want at Home Depot or Lowes and what ever else is the big box store in Canada. Have you read the book All New Square Foot Gardening? All is revealed. @sanderson wrote: Skidmoca, You can find most of what you want at Home Depot or Lowes and what ever else is the big box store in Canada. Have you read the book All New Square Foot Gardening? All is revealed. I got the book for Christmas, which started me down this path. I was wondering if there are other stores that sell it. I've seen various varieties of compost which will help. Skidmoca, unfortunately you may not find coarse vermiculite in large quantities at a big box store such as Home Depot in Canada. I get mine at a place called Ritchie Feed & Seed in Ottawa for about $30 Cda for four cubic feet. You need to look beyond the regular stores and check out the bigger greenhouse, garden centres and seed stores. There has to be a ton of such places in and around Hamilton and the Niagara Peninsula given the amount of agriculture and fruit/flower/vegetable growing in that area. BTW I used to live not far from you in St.Catharines right next to Niagara Falls. One other thing is that the vermiculite may not be out on display. You need to ask someone knowledgeable if they have it in stock. I would never have known Ricthie Feed and Seed had it if I has not asked. Even then the guy tried to talk me into getting medium rather than large (coarse) vermiculite. You could also try to find an SFG Certified Instructor in your area who may be able to steer you in the direction for the MM supplies. I wish you much success. @trolleydriver wrote: Skidmoca, unfortunately you may not find coarse vermiculite in large quantities at a big box store such as Home Depot in Canada. I get mine at a place called Ritchie Feed & Seed in Ottawa for about $30 Cda for four cubic feet. You need to look beyond the regular stores and check out the bigger greenhouse, garden centres and seed stores. There has to be a ton of such places in and around Hamilton and the Niagara Peninsula given the amount of agriculture and fruit/flower/vegetable growing in that area. BTW I used to live not far from you in St.Catharines right next to Niagara Falls. One other thing is that the vermiculite may not be out on display. You need to ask someone knowledgeable if they have it in stock. I would never have known Ricthie Feed and Seed had it if I has not asked. Even then the guy tried to talk me into getting medium rather than large (coarse) vermiculite. You could also try to find an SFG Certified Instructor in your area who may be able to steer you in the direction for the MM supplies. I wish you much success. Thanks trollydriver, this is the kind of info I was hoping for. I'll scout around for a local business before trying any big box places. If a 4' x 8' garden holds 32 squares, how many squares will four cubic feet cover? I'm starting with 40 squares. Any other advice about mixing is welcome. Hope to get the 2 x 8 box going this weekend because it will hold my peas and lettuce. The other 3 x 8 space will be for warmer crops. My husband put in a raised bed in an unused space last summer. It's against a fence and is about 8 x 8. So I end up with 2 x 8 and 3 x 8 with a path in between. Working with what I have! Assuming you mix equal parts of vermiculite, peat moss and compost in quantities of four cubic feet each, that makes a total of 4+4+4=12 cubic feet. If you want a depth of six inches or 1/2 foot that will give you 12x1/2=24 squares. A box of 32 squares filled to a 6 inch depth will require a total of 32x1/2=16 cubic feet of material. When mixing I use a bucket (e.g., a 5 gallon bucket) to measure out equal quantities of ingredients and mix in small batches. Don't forget that the compost ideally should be made from five different sources. For me the easiest way is to mix batches of compost first before combining the compost with the vermiculite and peat moss. Now here is something very important. Peat moss is compressed in its package. The amount of peat moss will expand when it is fluffed up. You must fluff up the peat moss before combining it in equal quantities with the other ingredients. As well, some store bought composts contain peat moss as filler which also will throw off the ratio. If you can determine how much filler in the compost, I suggest adjusting the amount of actual pure peat moss and increasing the amount of compost accordingly. @trolleydriver wrote: Assuming you mix equal parts of vermiculite, peat moss and compost in quantities of four cubic feet each, that makes a total of 4+4+4=12 cubic feet. If you want a depth of six inches or 1/2 foot that will give you 12x1/2=24 squares. Is this what I'm looking for? Seems a little too coarse. Skidmoca, Coarse is what you want. Vermiculite is used in the construction industry for insulation fill between floors , walls and round the back of fireplaces. some times called " Mica Fill " . Perhaps try looking to builders merchants who sell brick cements etc as they might sell it too . PS. Have you checked out our sites vermiculite sourcing thread ? Very interesting comment, plantoid, because for some reason I keep thinking I need to go to Hamilton Builders Supply, but I didn't know why. It's that little voice that is always guiding you, but you don't always listen. Now I know what to ask them for and why I'm supposed to go there. Patience is a virtue, you will get what you need in time! Try local mom and pop farm supply shops. 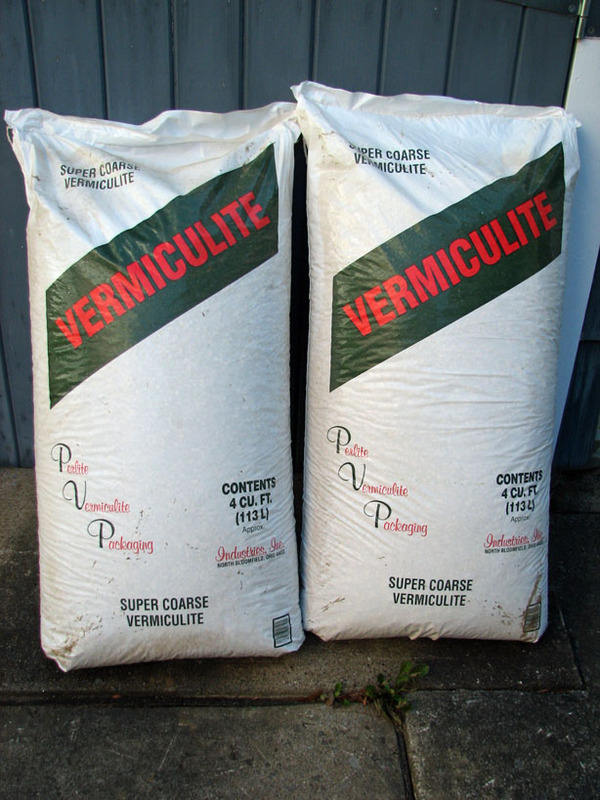 If you can get vermiculite there, try ordering the super course. Thats what I have been using and in my opinion should be labeled course. If you can get them to order from their distributor, it would be best to pick up everything you need from them in order to establish a nice relationship for further needs. As you can see below the labeled course is not really course it should be medium or less. 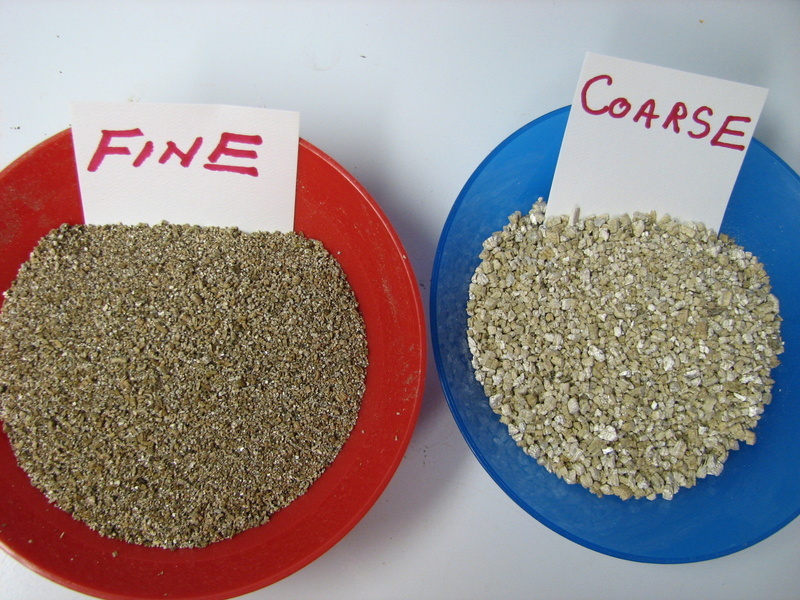 Vermiculite grades are known to be spotty.